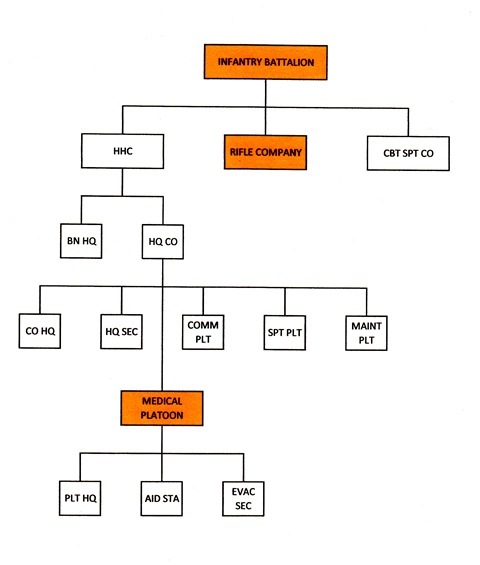 I was talking with Bill French recently and I told him I did not know how the Medical Platoon was organized and fit into the Battalion. After all, as a 11B grunt, I only had been exposed to a riflecompany, Charlie Company, and that was the extent of my understanding of the Battalion. Bill explained it to me and sent this Organization Chart. Bill was the medical platoon leader and our medics were assigned to the medical platoon, even though they spent time in the field with the rifle companies. I recall that the medics for Charlie Company, when I was there, were Bud, Charlie, Ray and Rex. If we had more, please let me know. So now we know…”the rest of the story.” See Bill’s story for more information.